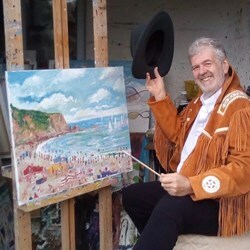 Simeon Stafford was born in 1956 in Dunkinfield, Greater Manchester and now lives in Cornwall. 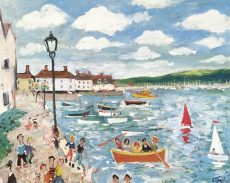 He demonstrated a talent for painting from a very young age, but it wasn’t until his mid-forties that he was able to follow his passion. 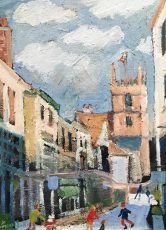 His joyful work is a reflection of his personality and his love of characterful people and places. 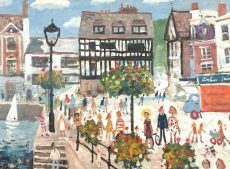 His recent first ever visit to Dartmouth has inspired this new series of paintings. 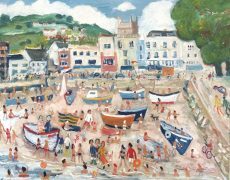 Armed with sketches, photographs and his own recollection, Simeon returned to his studio in Cornwall to create paintings that capture the soul of our location, often employing artistic licence to idealise a scene. A practiced eye will see the same characters appearing across Simeon’s paintings. Friends and relatives regularly appear, most notably Simeon’s aunt Dot doing a handstand with her dog Trixie. You might even find yourself in one of his canvases! Simeon’s paintings are held in private and public collections worldwide. Hugh Grant, the Queen and several notable film directors own Simeon’s work.